If you've already prepared your taxes and know you're due a refund, this can be exciting news. But if you're in the midst of a Chapter 13 repayment or a Chapter 7 filing, your tax refund may not be yours to spend. If you are involved in any type of insolvency proceeding and are expecting money back when you file, you need to know what happens to your tax refund in bankruptcy. Here's what you can expect depending on your filing circumstances. While you're in a chapter 13 repayment period, each and every tax refund will be taken by your Trustee and parceled out among your creditors. If this is okay with you, there's no need to make any adjustments, but you should know that you must never try and keep the fact that you've received a refund from your Trustee or the court. This can land you in hot water. Plus, they'll know because they will look at your tax returns. Strategies for chapter 13 filers: While you're in chapter 13, you may want to adjust your payroll withholdings so that your withheld taxes are lower, your paycheck higher and your refund check smaller or non-existent. You may want to err on the side of even having to pay a small amount of taxes along with your return to make sure you're not in a refund scenario. Why do this? Simply, your secured creditors (mortgage lender, auto lender, etc) will receive the lion's share of your plan payments. At the end of your three to five year repayment plan, the unpaid portion of unsecured debts such as medical and credit card bills should be discharged. Minimizing or eliminating your tax refund will put more money in your pocket, but shouldn't be enough of a take-home pay increase to bump up your plan payment significantly and will maximize the benefit you get from unsecured debt discharge. 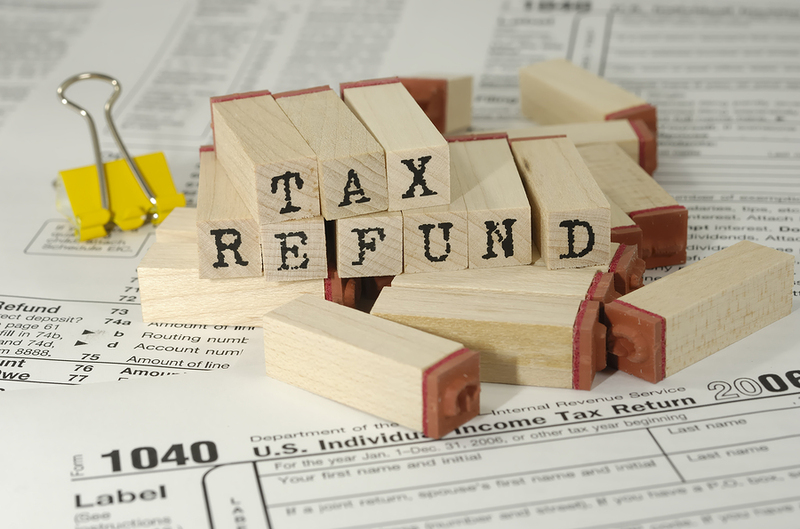 You may think the only tax refund that will impact your bankruptcy is one that you get just prior to your filing your chapter 7 or between the time you file and receive your discharge. But if you normally receive a tax refund, the Trustee may calculate a portion of it to be considered an asset. For instance, if you file bankruptcy on July 1st, six months of your tax refund can be considered to be accumulated. If you normally receive $2,500, the Trustee may include $1,250 of this as an asset. You can claim this among your exemptions if you haven't used up all of your standard and wild card exemption amounts on other assets. Strategies for chapter 7 filers: If you think you may file bankruptcy in the coming months, we suggest that you drastically increase your exemptions so that you minimize or eliminate the chance of getting a refund and increase your per payroll take home pay. And as a long term strategy, this is smart money because you don't need to give the government an interest free loan of your money. While it may be tempting to want to get back a lump sum each year as a refund, having more money throughout the year is a better means to ensure you can pay your bills year-round. No matter what type of bankruptcy you're considering filing, check out these tips for what not to do with your income tax refund. Contact the law offices of John T Orcutt for a free consultation on filing a chapter 7 or chapter 13 bankruptcy in North Carolina to get the financial fresh start you need.